Do you love using essential oils while decorating for the holidays? To me, one of the biggest parts of Christmas decor, is having a home that smells like Christmas. That can mean having a live tree, wreaths, and of course, the smell of peppermint and fresh baked cookies. While the fresh baked cookies are a bit more effort, it doesn’t mean you have to forgo your home smelling like Christmas. For this, we love using essential oils and a variety of fun DIY projects to help everyone in the household get in the Christmas spirit. 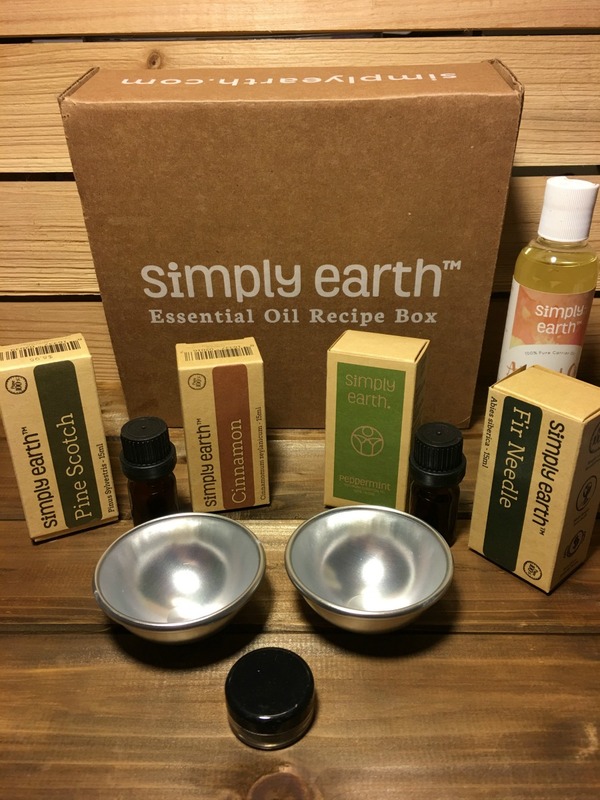 For the past two years, to help me get in the holiday spirit and de-stress, I always depend on my favorite essential oil box – the Simply Earth Box! Holiday Simply Earth Box: What is It? Looking for a fun box filled with projects and fun essential oils? If so, we think you will love the Holiday Simply Earth Essential Oil Box. Every month, they give 4 four sizes bottles of essential oils, extra for recipes, and more. Each month also has a unique, fun theme (for example, this month being all about Christmas!). See what they have to say about the December box here! Honestly, I think this box was really cute, and allows you to try a variety of fun essential oils that are perfect for the holidays. Best of all, all the essential oils are things you can use year round, so you can enjoy your house smelling like winter anytime, or just relax with the smell of cinnamon or peppermint – as someone who loves peppermint, I am always happy to see it in boxes, especially in nice sized bottles. While diffusers and recipes are also great, what really caught my eye from this box was the materials to make bath bombs. I don’t know about you guys, but during the winter, I LOVE relaxing in hot water with a bath bomb. Having something to teach me how to make these at home is fantastic, especially since they give you a nice metal mold in the box. Overall, I have to say I am pretty happy with the Holiday Simply Earth Box and can’t wait to make more of the amazing projects in the box. 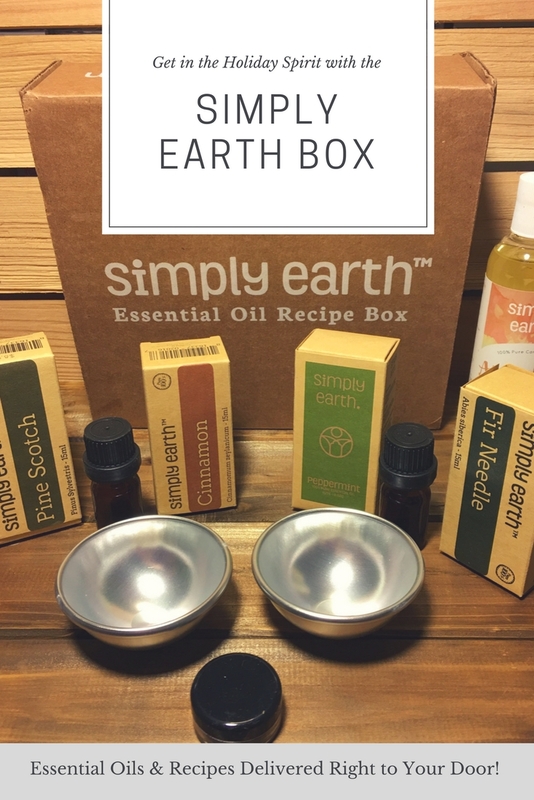 Holiday Simply Earth Box: Where to Purchase? Would you like to purchase this box for yourself? You can get this amazing essential box for as little as $39 a month. Also, if you use this following code – SUSANBEWLEYFREE – you will get a free $40 gift card emailed after subscribing to your first box! 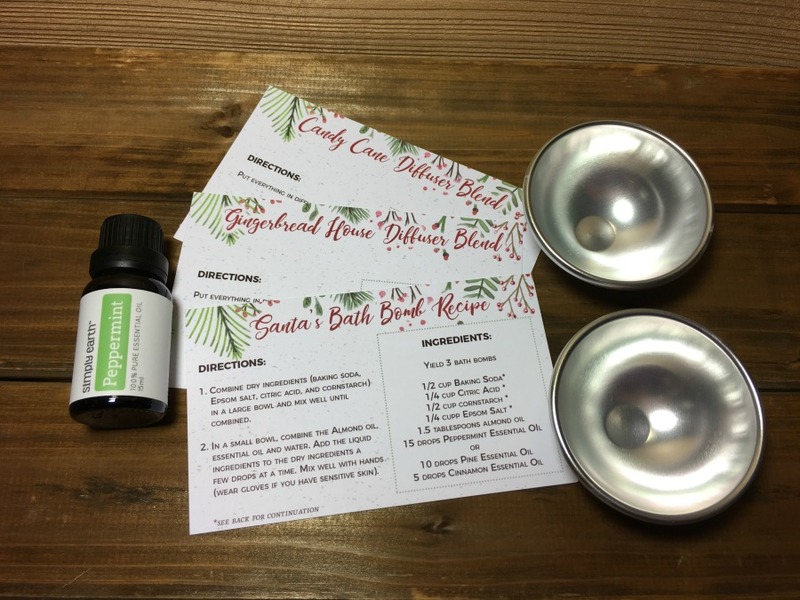 Make sure to check out the Holiday Simply Earth Essential Oil Box today! Want to learn more? Make sure to check out Simply Earth on social media! I love that it’s a recipe box, not just the essential oils!! Its gives you ideas and ways to use them!! Such a perfect gift or resource to make gifts!! Yes I do like the house to smell good especially at Christmas. I have 2 dogs and 2 cats so I never burn candles anymore. I’m afraid the cats could tip them and the chemicals could be harmful to the dogs. I have been using Wintergreen oil and would love this package. In general, I’m not a fan of monthly shipments. This sounds pretty good though. This is a great way to try essential oils. It’s hard to know what to buy and how to use them properly. This would make a fantastic gift! This would make a fantastic gift. I know several people who would love this. I like the idea of making the oil. It’s a great idea to gift someone. thse earth boxes look great to try. I really like the idea of this subscription box. However, the price is a bit much for me for every month. This sounds really great and that’s a great deal too. I love that they give recipes that tell you how to use the oils. This looks like a nice gift, I’d love something like this. I’ve been interested in learning more about oils. Love that the box includes great ways to use the oils. May give it a try! I have been curious about oils for some time. I have yet to use anything past the very basics. I need more hours in the day this is so interesting. I’ve never heard of this brand before. I love essential oils though. We use peppermint and tree oil a lot around my house. I love essential oils. This subscription box sounds like something I would love!